KITsubs: Kamen Rider Super-1 Episode 04, v2! Kamen Rider Super-1 Episode 04, v2! And with this episode, we're done with our v2 releases for Kamen Rider Super-1! From now on, any releases will be all new episodes. And we already have one in store for you! In this episode, Kazuya meets his old friend, Ismael Grabada. The two of them went to college together in the United States. They were classmates, and best friends. Oh, and Ismael just happens to be a prince. Because why not. But MechaMantis has other plans for Prince Ismael, and his wedding day turns into some good old fashion Dogma shenanigans before you know it! All right, now that these are out of the way, it's time to move on to new episodes. I know you've all been waiting a long time for more Super-1, and we're very happy to be able to bring it to you! 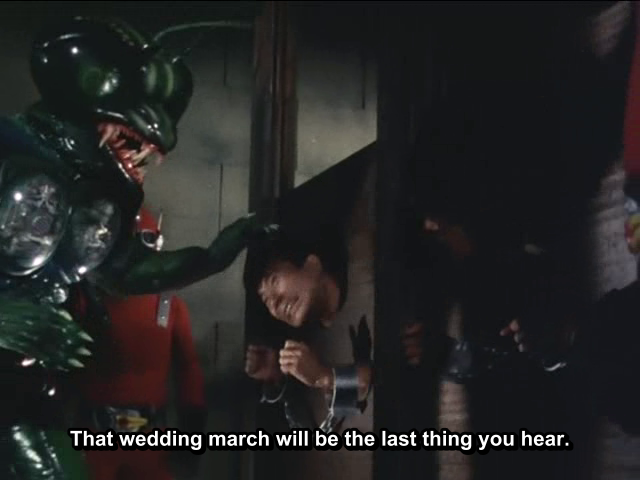 But before that, come back this week for another episode of Skyrider! And then starting next week, we'll be back to our normal once-a-week release schedule. Yea! I'm looking forward to more of everything. Thank you for all the work. Is everything ok? Haven't heard from you guys most of the month. Kamen Rider Skyrider Episode 22!